What an awesome way for the USA to celebrate its Independence Day! On July 4, 2016, 11:53PM Eastern Time (ET), the National Aeronautics and Space Administration‘s (NASA) spacecraft Juno has successfully entered Jupiter’s orbit, making it the probe that has came closest to the planet so far. NASA received confirmation that, at 11:18PM ET, the vehicle had turned on its main engine. 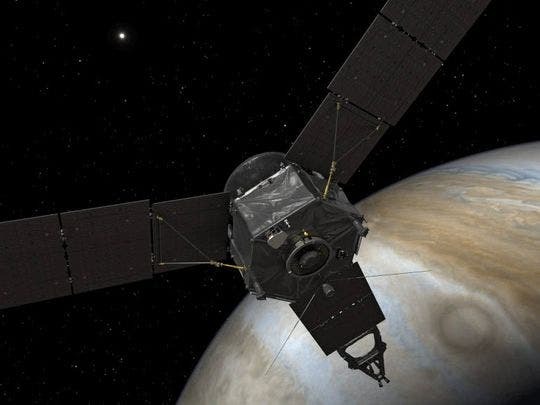 Juno ended its nearly five-year journey, which started in August 2011, becoming the first spacecraft to enter Jupiter’s orbit since NASA’s Galilleo in 1995. For most of Juno’s intended 53-day orbit, it will be far out from Jupiter, avoiding its intense radiation belts, debris fields, and powerful magnetic fields. But at the end of the 53-day cycle, Juno will swoop in close over Jupiter’s equator through the north pole then will back out into space over the planet’s south pole. To protect the probe from Jupiter’s unforgiving environment, NASA’s engineers encased Juno’s flight computer and other sensitive parts in a 400-pound titanium vault. This is necessary in order for Juno to perform its probe on the king of the planets. It will attempt to study Jupiter’s magnetic and gravitational fields in detail, measure the amount of water in its atmosphere, and determine whether or not it has a core of elements heavier than hydrogen and helium. Findings about these will hopefully reveal the “recipe” for how solar systems are made. For more details and updates about Juno’s journey. check out its official NASA mission page. 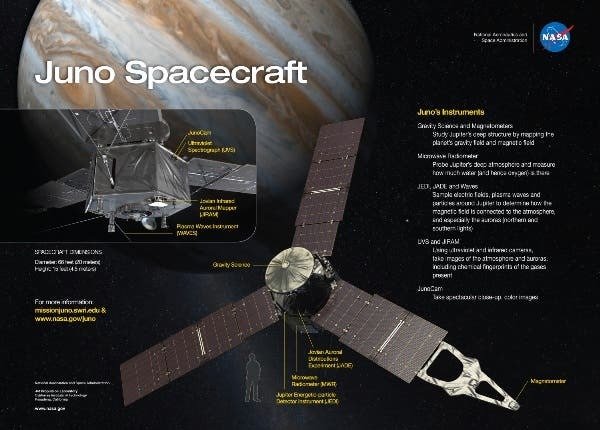 What do you think Juno will find out about Jupiter?